I started an evening class in Genealogy in the Autumn of 1992. It was something I'd always intended to do one day, if only to find a better answer to give to the perpetual question, "Skirrow, that's an unusual name - where does it come from?" Dora Kneebone was an elderly lady with a fascination for other people's family histories that fitted her well for her subject. Week by week she told us how to go through the various stages. Firstly we could use the Mormon records, then we should visit St Catherine's house, and the office of Population and Census nearby. She gave us a little map and marked the little cafe where we could get a sandwich and a cup of tea. 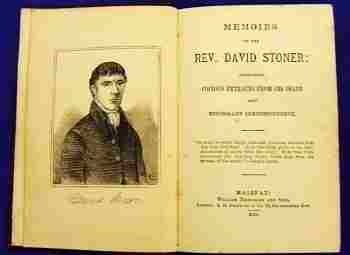 Then we could visit churches and look for gravestones, but if we wanted to see parish records we must make an appointment with the vicar, whom we should reward suitably by donating to his church fund. We could aim for a 'total ancestry' chart, or, in the case of a rare name there was always the 'one name study'. Mine was a rare name I thought, so I started by looking it up in the reference books. Most were vague, but one said that the name probably originated in the village of Sharrow in Yorkshire, the change from sh to sk being common in Yorkshire because of Viking influence on the language. That made sense; my dad came from Leeds. I also spent a few hours in the library going through all the telephone directories for Britain and copying down every Skirrow entry - a hundred and fifty in all. I marked them as dots on a map and they centred on Bradford, with just a scattering as far away as the south coast. That was just the sort of number for a one-name study. One thing Dora always stressed. "Go to the women in the family," she would say. " They are the ones who keep things, and remember." So I asked my mother, but she knew little about the Skirrow side of the family, and my dad, though still alert and full of memories, couldn't think why it had never occurred to him to ask about his grandparents: as far as he knew, he never had any, his dad had just never talked about his past! Then mam suggested I could look through the old bookcase in the front room. Grandad had made it, being a cabinet maker for the Leeds Co-op all his life, and I knew it contained some old books that had been his. There was 'Uncle Tom's Cabin', and 'Milton's Poems', and a number of religious books, such as 'Gods Gift to Two', but now I was looking at the inside covers, and most of them had labels I'd never noticed before, with inscriptions like 'Albert E Skirrow - 1st prize for handwriting - Charlestown Wesleyan Society' - that was my grandfather. 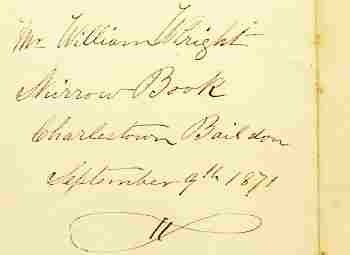 One had a curious entry - 'Mr William Wright Skirrow Book' - Charlestown, Baildon - 1871. I'd never heard of Baildon, but I got out the road atlas and there it was on the edge of Ilkley moor, not far from Sharrow. Who could William Wright have been? Finding names in St Catherine's house proved tedious without knowing any birth dates, so I set off on the train one day to visit the census office. The place fascinated me. Just as Dora had said, it was an underground rabbit warren of corridors and rooms full of microfilm readers. I put my numbered tag round my neck and set off to look for the microfilm reader of the same number. Then I looked up Baildon in an index and found the microfilm number for the latest census available after the statutory hundred years secrecy - 1891. More corridors and rooms and I found my microfilm, replacing it with the dummy from my reader as instructed. What a clever system: if you tried to take the film back to the wrong cabinet you wouldn't retrieve your dummy cartridge, and if you found a dummy where the film you wanted should be, then you knew it was in use. For once I was impressed! Now I could settle down to my search, street by street, through three thousand handwritten addresses, looking for Skirrows. An hour later my eyes were getting tired when suddenly I got a surprise. Not just one Skirrow, but eight in a row at two adjacent addresses in Ada Row. Suddenly I was confronted with a wealth of information I hadn't thought about. There was Albert Ernest, my grandfather, aged 13 and listed as a 'bobbin pegger', and William Wright, his father and a widower at 41 was a life assurance agent. Excited by my findings, I searched the next film - 1881, and then 1871, until my eyes were blurred and the cabinets were being locked up. A month later, I completed my search back to the start of the ten-yearly census records in 1841. In several films I found the heading 'Skirrow Houses', followed by a block of eight houses in Ada Row, all occupied by Skirrows. Ada Row, it seemed, was home to four generations of Skirrows, all working in the Worsted weaving mill from the age of twelve, each generation having around eight children who sometimes married and lived next door, and as I pieced together their story I began to realise that a subtle change had occurred. I had started this search for my ancestors with the aim of collecting names and dates for a tree, but now I was beginning to know these people and their way of life. I may have been taught at school that the Victorians had big families and worked long hours in the Northern mills, but I hadn't really assimilated what that meant. Now I was reading, in the actual handwriting of that census collector over a hundred years ago, that my grandad was a bobbin pegger at twelve - and I was trembling with excitement! Gaining a feel for the actual lives of my ancestors during the industrial revolution suddenly seemed far more valuable than trying to trace back my more distant origins, and endless possibilities for finding out more were revealing themselves. So it was that I began to visit Baildon, on what was to become a twice yearly pilgrimage with my two boys and their grandparents. 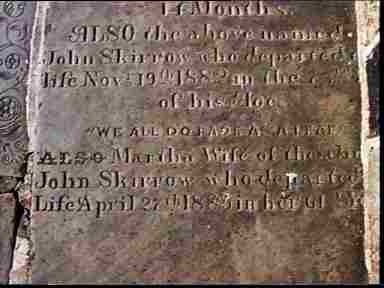 On our first visit we got to know the little town of Baildon, bought a few books, and found a gravestone in the path of St Johns church that listed the names of John Skirrow, my great great grandfather, his two wives and some of his children. 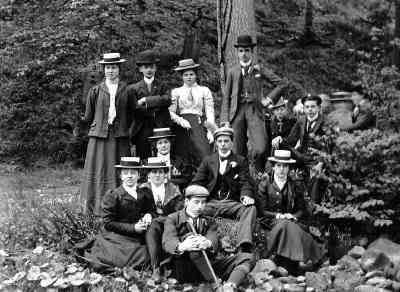 I contacted Fred Skirrow, from the local telephone directory, who turned out to have known my dad as a boy, and who was able to identify several people on a little photograph from my mothers album, taken in 1905. 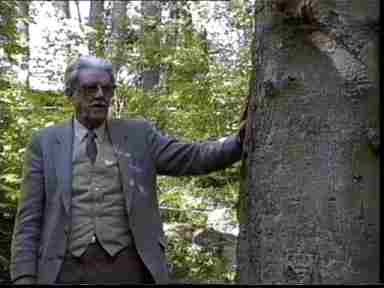 He also knew where it was taken: Shipley Glen, a famous beauty spot just a mile from his home. That photo took on new meaning when I scanned it into my computer and enhanced it electronically, printing it out on four A4 sheets which I carefully stuck together. We walked through the glen, and even found the tree, now somewhat thicker, by which we reckoned the photo had been taken, and as I look at that photo I feel a very real link with that former age of hats and watch chains and Sunday walks. Our next visit was to look for the former site of Ada Row (later changed to Ada St). Fred had known it, but now it had gone he said. He had walked there only the other day and the whole area had been recently rebuilt with modern houses - what a pity. 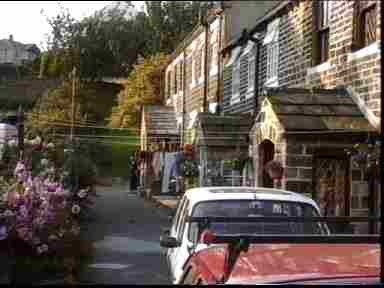 Arriving in Baildon, I asked directions at the newsagents shop. . "Oh I think its still there," said the girl, and we set off for the area by the river still known as Charlestown. Driving along the straight road we saw the modern houses, and pulled in to explore on foot. Then we came across it. "Ada St", said the sign at the entrance to the one little row of stone cottages. One side had been demolished, but the other had been renovated, and yes, there was number 5. A hundred and fifty years, and it was still there! Its occupants, a young couple, no doubt wondered at the little group taking photographs of their home, but they soon became interested in what I had to show them, and invited us to look round, proudly displaying the old fireplaces that had been covered over for years until they exposed them. They showed us an old postcard they had discovered during their work, but it revealed no clues to the former occupants I now knew so much about. The rooms were quite tiny, with just a living room and kitchen downstairs, but the walls looked fit to stand for a long time yet. We still make our little trips to Baildon. 'Visiting the dead dudes', the kids call it! Each time we drive up, I try to include something of more general interest - last year we visited the Industrial Museum at Bradford, based in an old wool mill, where we saw working looms and other machines of the type used in the nineteenth century as well as an exhibition of old cars. 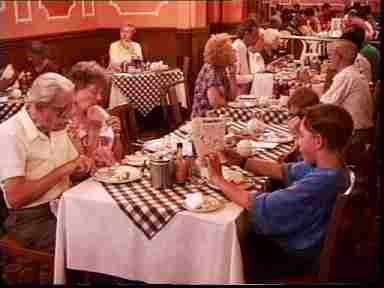 Another time we visited Otley, and stopped for fish and chips at the famous 'Harry Ramsden's' on the way home. 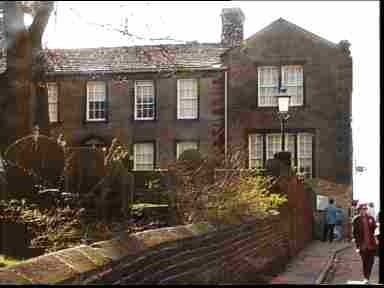 This spring we visited the old Parsonage at Hawarth, home of the Bronte Sisters. To keep the boys happy, we started the day at the National Museum of Photography Film and Television in Bradford where we watched a spectacular film of 'Yellowstone' on the only giant 'IMAX' system in Britain - and grandma and grandad were quite taken aback by the screen five stories high! I'm sure Chris and Neil will remember these visits, and that, together with my writings and records they will form a valuable link with the past in years to come. Who knows, they may find themselves visiting Ada Street in fifty years time, and looking in awe, as I do now, at the place where their ancestors lived in that age when Yorkshire was at the centre of the industrial revolution and world textile production; when Bradford was home to mechanical innovations that were at the cutting edge of world technology, and when the Brontes were writing 'Jane Eyre' and 'Wuthering Heights' just a few miles away! Darwin was just thinking about evolution; and the age of electronics, television and genetic engineering didn't even figure in the wildest dreams of science fiction writers! I think my sons have a lot of growing up to do before they will grasp all that.